One of the most fragrant vines of South Florida, confederate jasmine is blanketed in spring with sweet-scented white flowers. 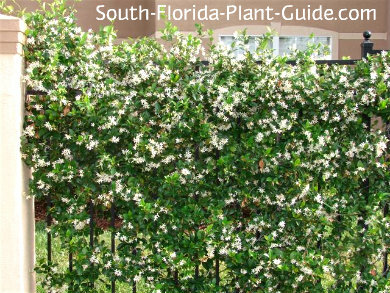 The tiny white blossoms appear in April and May; the rest of the year this is a handsome vine with small and glossy deep green leaves that can provide complete privacy with the right support. This plant thrives in any light - full sun to full shade - though it will flower more heavily in sunnier areas. A moderate grower, it picks up the pace as it gets more established and turns into a fast-growing vine. 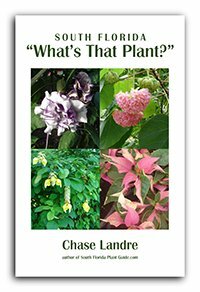 It's now available in a new variegated variety to provide interesting color year-round. 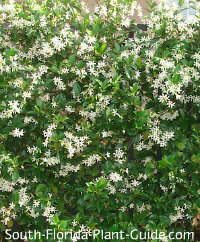 Confederate jasmine can be used on fences, pergolas, you name it...but the closer to the house, deck or patio the better in order to enjoy the lusciously sweet fragrance. Though it's not considered toxic, wear gloves and your old clothes when cutting this vine. The woody stems contain a milky, sticky sap that may irritate your skin, and if it gets on your clothing the stains are downright impossible to remove. 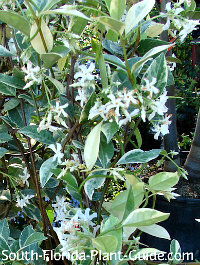 Other sweet-smelling jasmines of South Florida include night blooming jasmine and crape jasmine. 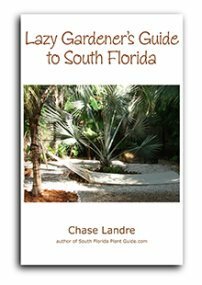 These moderate to fast jasmine vines are cold hardy and thrive anywhere in Florida. They will grow in sun or shade but produce the most flowers in sunnier spots. If planting in a row, place 3 or 4 feet apart. Keep a distance of about 4 or 5 feet from the nearest shrub or tree unless you plan to trim frequently. Amend the soil with a combination of top soil (or organic peat moss) and composted cow manure added to the hole when you plant. Prune back hard after the spring bloom is finished. Trim anytime to keep the vine shaped. Drought-tolerant once established, this vine does best if you water regularly with time in between waterings for the soil to dry out a bit. Fertilize 3 times a year - in spring, summer, and autumn - with a top quality granular fertilizer. 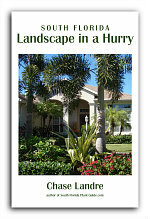 LANDSCAPE USES: Trellis, lamppost, arbor, fence, planter to cascade down a wall, lattice carport enclosure.